We were over Cuba on a flight from Aruba to Miami. This was a connector to return to Washington DC. The "Take It" comes from my ever present facination with clouds. 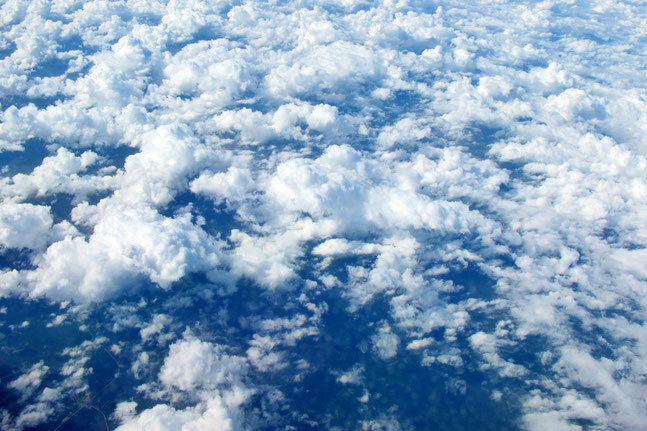 To help facilitate photos of clouds I now ask for window seats on flights rather than my previous request which was always for isle seats which are more convenient for general use. In my now found preference, I am rewarded with an ongoing show. There are times when just a clear sky is a wonder to behold, so either way, I/we are winners. The After Take: There was just something about hearing the pilot announce our location as being near or over Cuba. I had never been this close to this controversial place in our hemisphere. Tempted though I was to get into historical detail, I did my best to just let it go as a sort of background composite to the the wonder of the cloud configurations below us. These were the kind of clouds that many times yield forms, and most of all, the highly sought similarities to faces. This set did not disappoint. Such fun to be looking down instead of being on the earth surface looking upward which is my usual viewing vantage point. Without trying to explain myself, because on this I cannot, I sometimes wonder if the faces we see in the clouds may be those of actual people who have passed on, and are being given a brief chance to come back for a look back from a distance at what they have left. To further this, I sometimes almost feel like giving a face full sky a wave of greeting. A sort of back at ya kind of thing. Well enough of this, lest I get a knock on my door. Wishing you happy and many cloud watching's. These watching's are ever so much more enjoyable when shared with another, especially with a child. I think that the fewer the better with shared viewing's, for larger gatherings may take on a sort of contest like feel as there seems to be an inclination to compete for the most creative shape conjured. With competition, the result becomes different, not bad mind us, just a different kind of enjoyment. I have found an additional benefit to the window seat. Not only can I see the clouds, but no one is climbing over me to get to it. As always, I can never get enough of the clouds! You can fly over Cuba, but apparently if you go to Cuba you can face charges in the US. I believe that is because the US has an embargo on China. This reminds me of a quote from the HBO series John Adams. "So our umbilical cord to mother earth has been severed for the first time in history. Mankind floats on a limitless plane of air." These comments are being approved very fast! Hahaha, ya I am guessing the admin is currently working on the site or something and is just updating it as he sees them. Am I right? Yes that would be correct Gabe. Hahahaha, see admins are posting here with us tonight. So what are pictures are your favorite? My two favorites are this one and "Flying Saucer Landing." You? My favorite photo would have to be the "Now That You Are Here, Let's Talk." I think Bruce did an exceptional job capturing that one. My favorite......man that is a really tough one. I don't think I can pick any one photo. Really there are only a couple photo's here that didn't do it for me. Each and every other photo is amazing. He is a truly great photographer. I'll have to look back and get back to you on which I consider my favorite. Yes please do get back to us on that one Gabe, I too am curious. I'm not sure i have a favorite picture, but my favorite section is the Eyellusions.